All that has been published in Aljazeera on the Kashmir Conflict. The story of Kashmiri Pandits is an extraordinarily difficult one to tell. One the one hand, when the insurgency erupted in Indian-administered Kashmir in 1989, thousands of Pandits left the valley, suggesting that the community suffered enough intimidation to abandon their homes. On the other hand, the accounts of Kashmiri Pandits who stayed behind in Kashmir contradict claims by Pandits in the diaspora who say that Kashmiri Pandits suffered ‘a genocide’ and were forced ‘into exile’. Indeed, understanding the experience of the Pandits, caught between Kashmir’s Muslim majority and the ambitions of the Indian state, is an intricate affair. Even the semantics describing the flight of the Pandits from Kashmir are highly politicised and contentious. Azad Essa speaks to Mridu Rai, the author of Hindu Rulers, Muslim Subjects: Islam, Rights and the History of Kashmir about the Kashmiri Pandit community and how they fit into the dispute. If you were the Franklin Mint and wanted to issue a set of four collectible dinner plates devoted to “The Women of the War on Terror,” whose faces would appear on them? If you are wondering who is the bikini (and thus the whore) in that formulation, Ms. Scroggins leaves little doubt that it is Ms. Hirsi Ali, whom her book relentlessly attacks, sometimes persuasively but often tendentiously. But we are getting ahead of ourselves. Ms. Hirsi Ali is, you will recall, a Somalian-born former member of the Dutch Parliament. She wrote the best-selling memoir “Infidel” (2007) and, once seen, is hard to forget. In the words of the British journalist Andrew Anthony, she “looks like a fashion model and talks like a public intellectual.” Brought up as a Muslim fundamentalist in Kenya, where she was subjected to genital cutting, she escaped to the West and has emerged as an incendiary critic of Islam, especially on issues regarding women. She is married to the British historian Niall Ferguson. Ms. Siddiqui’s story is just as unlikely, and seemingly made for a tense Kathryn Bigelow film. Born in Pakistan, she left for America to study neuroscience and earned degrees from the Massachusetts Institute of Technology and Brandeis University. She married a Pakistani doctor who was accepted to study for a master’s degree at Harvard, with whom she had three children. She also became a nearly psychotic anti-Semite, and began dabbling in pro-jihad organizations in America. In 2003 the F.B.I. named her the only known female operative of Al Qaeda. Ms. Scroggins is a veteran reporter whose very good first book, “Emma’s War” (2002), was about a young British aid worker and tarnished idealism in the Sudan. In “Wanted Women” she seeks — and abundantly finds — what she calls the “weird symmetry” between her subjects. As “Wanted Women” progresses, following these women is like watching two deciduous trees in an arboretum: while one soars and bends toward the light, the other shrivels and grows stunted. Ms. Hirsi Ali makes her way to the Netherlands and revels in that country’s freedoms. Ms. Siddiqui becomes more and more devout, rejecting drink and dance and music and movies, and pinning her black veil so that only her eyes are visible. A gifted speaker, Ms. Siddiqui becomes an important fund-raiser for Islamic groups with links to Al Qaeda. She ultimately marries into the family of Khalid Sheik Mohammed, the principal architect of the 9/11 attacks. In 2010 she was sentenced to 86 years in prison for, while in captivity, the attempted murder and assault of United States personnel. It is to Ms. Scroggins’s credit that this book is vastly more multidimensional than it at might first seem to be. She works hard to make both women come alive, and to both she is to some degree sympathetic. This book’s interwoven narratives allow her to strike chords that might otherwise have gone unstruck. 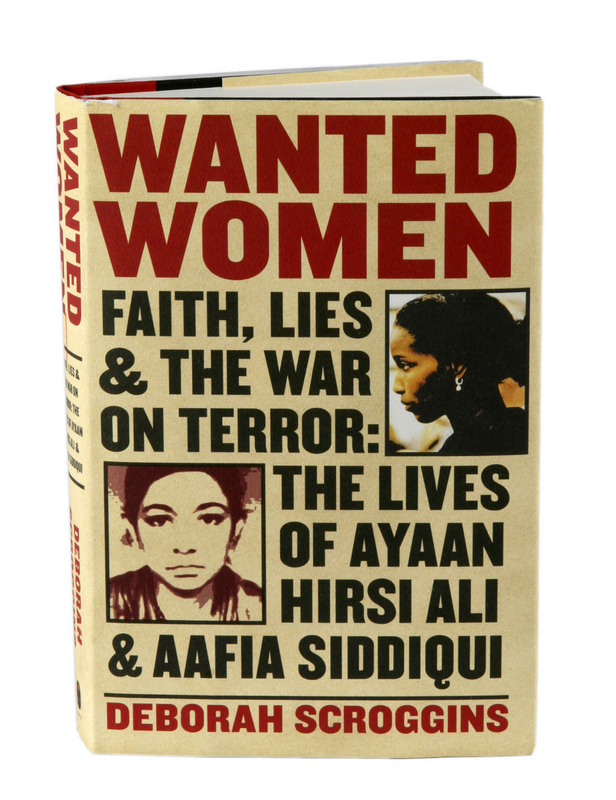 Yet by its second half “Wanted Women” becomes a rowdy assault on Ms. Hirsi Ali, whom Ms. Scroggins accuses of being imperious, deceitful, egomaniacal and divisive, of whipping up racial hatred through her unsubtle criticism of Islam. She swings lower, pointing out that Ms. Hirsi Ali used a ghostwriter and visited an “expensive hairdresser” to straighten her hair. She notes that Ms. Hirsi Ali supported the American-led invasion of Iraq, and that she has fallen in with the American Enterprise Institute, a right-wing research center. She comes close to laying the slaughter last year, by a lone gunman, of those 77 young Labor Party campers and others in Norway, at Ms. Hirsi Ali’s feet. She notes that the killer’s manifesto proposed Ms. Hirsi Ali for the Nobel Peace Prize. Ms. Scroggins’s portrait of Ms. Hirsi Ali is eye-opening, and important. Her punches mostly land. She is especially good on how Ms. Hirsi Ali made it “possible to appeal to the Dutch xenophobic vote in a socially acceptable way.” She is persuasive on how East and West will need voices of reconciliation, not merely stern condemnation. Ms. Hirsi Ali is a complicated and imperfect person. But her fights have employed words and an attempt at reasoned debate, while Ms. Siddiqui left those things, and civilization, behind. It is possible to appreciate both burkas and bikinis and still wonder why this book’s sympathies seem to be with the woman who hoped to speak through the most destructive weaponry available.